The Ireland men's national rugby league team, known as the Wolfhounds, is organised by Rugby League Ireland. The representative team is dominated by players from the Super League and sometimes includes players from the Australasian National Rugby League. Ireland is also represented by an Ireland A side, which is made up of players from the domestic Irish competition. Since Ireland began competing in international rugby league in 1995, it has participated in the 1995 Rugby League Emerging Nations Tournament, the 1996 Super League World Nines, and three Rugby League World Cups – 2000, 2008 and 2013. They have also competed in the Rugby League European Nations Cup and Victory Cup. Ireland A compete in the St Patrick's Day Challenge in the USA and in the Amateur Four Nations. 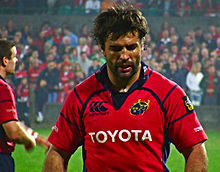 Irish players have in the past been selected to play for the Great Britain side, one recent example being Cork-born Brian Carney. However, since the Great Britain team was split into individual nations in 2007, it is unlikely that this situation will arise again. The Irish rugby league team is one of many Irish teams that draws its players from across the island of Ireland, it utilises the Four Provinces Flag of Ireland and the anthem "Ireland's Call". 1997 saw more England-based Super League players making themselves available by use of the grandparent rule. The Irish team improved its standards but this development gave less opportunity for Irish-based players to get a chance to play. However, Irish-based players were included in the Irish squad for the triangular tournaments in 1998 against France and Scotland and 1999 against Scotland and Wales. Their success was enough to earn a place in the 2000 World Cup. Finishing top of their group, the Irish eventually lost 26–16 to England in the quarter-finals, but the performance set the scene for future developments in Ireland. Ireland were drawn against Lebanon and Russia in Europe's 2008 Rugby League World Cup Qualifying Pool Two. Ireland topped the group with a 16–16 draw with Lebanon at Dewsbury on 2 November 2007. The draw meant Ireland qualified for the 2008 World Cup on points difference from Lebanon as both nations gained the same number of group points. Ireland at the 2008 World Cup. At the 2008 World Cup in Australia, Ireland were in Group C along with Tonga and Samoa. They lost to Tonga on 27 October in Parramatta, Sydney, but were victorious against Samoa, again in Parramatta, on 5 November and topped the group on points difference. As the group winners, they played Fiji, winners of Group B, for a chance to qualify for the semi-final. Fiji won 30–14 and so Ireland were eliminated. Mark Aston the head coach and driving force behind the Sheffield Eagles as been confirmed as the head coach of Rugby League Ireland. His appointment was announced at a press conference in Sheffield on Tuesday 24 May 2011 and he is confirmed in the role for the World Cup in 2013. The Ireland A team is selected from players in the Irish domestic competition. This team is administered by Rugby League Ireland. The 'A' team competes each year in the Amateur Four Nations with England A, Scotland A and Wales A. ^ "Ireland announce train on squad for European Championship". Total Rugby league. 17 October 2018. Wikimedia Commons has media related to Ireland national rugby league team. This page was last edited on 19 February 2019, at 11:47 (UTC).